Mauser 98 – bare basics. It’s genes live on in most modern bolt rifles. As you know, Bob Martin is gone now. Years ago he had offered me his Mauser. I can’t remember why I had declined at the time. Now, a little while ago, his daughter said that the Mauser was the only one left of Bob’s long guns. This time I bought it. “Gew 98” (which stands for Gewehr - or Rifle 98) is marked on one side of its receiver. On top we read “Erfurt 1917” and also “1920”. Makes me wonder what its true story is. Somebody had sporterized the thing by just cutting the original stock back. That job turned out as rough as the rest of this rifle. The barrel has some pits on its outer surface, but the bore seemed fine – showing the typical old dark but deep rifling. Caliber is 8x57. So, it’s just an old rifle. In fact it resembles bare basics. Not a thing on it which isn’t needed. Designed and built to function. Indeed made in Germany, not some Yugo or elsewhere product, and I wanted to shoot one of Bob’s guns. Unfortunately I never talked to Bob about his 98. So I don’t know when and how he got it, and certainly not how much shooting it has seen. 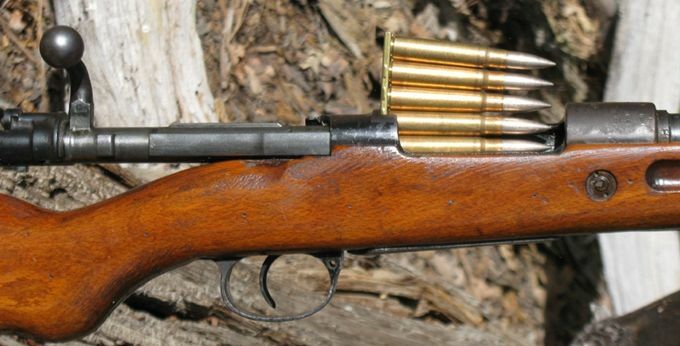 This Mauser did trigger a memory. Not yet a teen, I tagged along when my older brother went for a leisure stroll in the woods close to home, a few miles south of Hamburg, Germany. He accused me of behaving like a blood hound, with nose to the ground, when I detected a fired cartridge amongst the pine needles and picked it up with a childish shout of “look!” The empty, still mostly in brass color, had a black sealant around the primer and a head stamp that read “RWS – 8x57JS”. My first encounter with the 8mm apparently left a lasting impression. It may have contributed to my decision to buy Bob’s 98. Another factor may be this: Converted 98Ks at least used to be common on the hunting scene, here as in Germany. Maybe especially so after WWII, once Germans were again allowed to have private firearms possession. Some Frankonia catalog I remember from many years ago offered mostly ‘new’ rifles of that time, such as Mauser 66 or Steyr’s finest, and at a noticeably reduced price also sporterized 98Ks with double set triggers. Hunters in my family, a late uncle and late cousin, both took their roe deer and the occasional wild boar with such rigs. 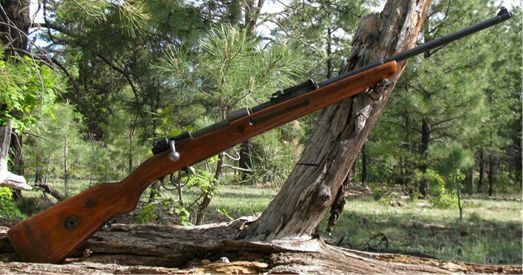 Then ‘progress’ waged its deception, and the 7x64 Brenneke (what later the .280 Remington basically copied) seemed all the rage, shooting lighter projectiles flatter. The good old 8x57 all but faded. Today I’d call it ‘saved’, by a wild beast. Late in the 90s in Germany the Russian boar population took off, due to good game management and a change in agricultural practices of growing a lot more corn. Drive type hunts, where shots are typically taken at moving game, demanded more of cartridges to compensate for poorer shot placement. A 7mm projectile does not seem to have the knockdown that such numbers as a 308 Win or the good old 30-06 have, both well liked there as here. 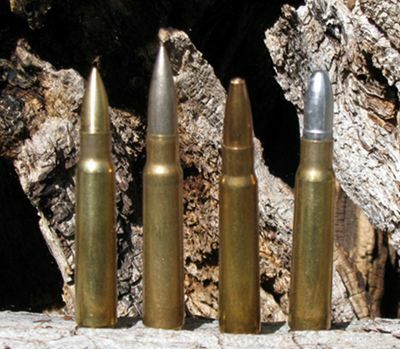 And if a .30 caliber deals more effectively with moving game than a .284, then a .323 diameter projectile can do even more. The 8mm delivers knockdown performance with tolerable recoil. Guess what – all European rifle manufacturers now offer that caliber again, while some have dropped the 7x64 darling altogether. Contrary, in the US anything 8mm sells about as well as diesel cars (undeserved for both). Good luck finding an 8mm match-grade aftermarket barrel, for instance. Above .30 caliber the .338 rules here. Anyway, it is very unlikely I’ll hunt with Bob’s 98K. It does have a curved bolt handle. So adding a scope would be simpler. Oh, that brings me to the open sights. When my eyeballs were younger I loved the slanted front post (Dachkorn). But now that is a challenge. Yes, the rear is adjustable to an optimistic 2000 meters. I’d like to try some day how ‘useful’ that may be. Hmmm, how would one do such verification, conveniently? My first taste of firing an 8mm Mauser came rather late. What had set it into motion was nothing other than low cost. Around the year 2000 old military 8mm ammo was offered everywhere, at prices less than you could buy typical jacketed bullets for. To go 8mm was simply the cheapest way to shoot a center fire rifle. Soon a used Turkish Mauser became mine. Its 29” barrel and a price of fifty bucks proved too irresistible. It turned out to be a rough number, a far cry from a 98K. Still, I had it scoped. That old warhorse performed. With concentration, operating the two-stage military trigger carefully resulted in 2 inch groups, with at least one of my home-made ammo. Yes, I tried my own despite the ‘cheap’ stuff available. Old military ammo would at least double the group. Some rounds would not go bang, some resulted in sticky extraction. Eventually I lost interest, and sold both gun and most of the surplus ammo. But from that experience I had a decent amount of commercial brass, dies, and a few projectiles left. This surely made my decision for Bob’s Mauser easier. Did I mention rugged? Just handling this old battle horse gives the impression that you cannot just shoot powerful ammo in it, but also use it to pound the snot out of an opponent. Oh, here is one more ‘data point’ regarding a Mauser 98 action. Sometime in the 50s my brother, not yet a teen, enjoyed a typical warm summer Saturday in Germany. He and friends were playing in some creek, a few miles from home. In a deeper pool where trees lined the banks and the creek made a turn they stepped onto something ‘pointy’. It turned out to be 8mm ammo, discarded by retreating German troops according to protocol. The stuff was late war manufacture, with steel cases instead of then rare brass. The next day my brother returned, armed with a burlap potato bag. He recovered all the ammo he could find in that creek. Those 8mms almost collapsed his bicycle wheel as he pushed his ‘treasure’ home. In those days 98Ks from the war were in regular ‘circulation’, treasures to a boy growing up in the countryside. He had at least one of them , as did his best buddy. Turns out that some of that creek ammo fired, but the majority did not. This improved greatly after drying the ammo - I won’t say how he did that. Still, those steel cases often resisted extraction. At one occasion he fired his Mauser at a running cottontail. The shot missed, but the bunny stopped in confusion, presenting another shot. Sure enough, that case stuck. Prepared, he simply pushed a 6mm steel rod down the muzzle, freed the steel case, and chambered the next ‘river round’. The bunny was still there, so he aimed for its head and squeezed. Fierce recoil sent my brother to the ground, and as he fell backwards he watched two arm-thick aspen get cut down! The bunny ran off. Yes, with total concentration on that rabbit my bro had not pulled the steel rod back out of the barrel. The rifle held, but the action was frozen. At home he hammered that action back open, after which the thing continued to work just fine. I hope it was an Erfurt specimen . Old surplus ammo looked in good condition, but wasn’t. OK, time to shoot Bob’s rifle! On my next trip to Table Mesa I took along some surplus ammo, and five reloads contained by Remington brass. Surplus stuff was first, and my shot hit a rather large rock maybe 150 paces away. Good start? No, no. Because when I pulled the bolt back, the case remained in the chamber, but the bolt opened. Fault of that old ammo? No, no. Cleaning rod pushed it right out. Same thing happened with my second shot. I fired a Remington case. This one the extractor pulled right out. I left it at that, put the Mauser away, shot some other guns that morning. On the way home I pondered. Can’t prove this, but I suspect somebody ‘adjusted’ something on that extractor. So my options are to go after a different extractor, or keep using commercial brass. By the way, this gun has the typical military steel buttplate. With full power ammo it kicks accordingly. I also wondered if the deep rifling may be beneficial for lead bullets. Ever heard of Buffalo Arms Co? They will sell you both jacketed and lead bullets. They even have a 125gr FMJ –well, I thought they were FMJs, intended for the first ever Sturmgewehr. Turns out that they are lead-free, made on a lathe from some copper alloy. Time to get busy and load 8x57s, a few anyway. For the 125 grainers I selected IMR 4064. Trail Boss fueled the 195 grain lead slugs. Old Surplus FMJ, dated 1943 2860 This stuff kicks! Pulled bullet weighs 154gr. Old Surplus FMJ, dated 1942 2790 8 out of 20 did not fire. When that bench session ended I was disappointed. The rifle’s extractor needs work. Even some modern brass was barely coming out of the chamber, and none ejected from the gun. The 125 grainers gave a shotgun pattern. The rest didn’t impress, either, grouping into 2 to 2.5 inches at only 50 steps. I had a few random military rounds left. Those I fired offhand, at rocks and stumps. That decreased felt recoil. And with the rear sight lowered all the way, they about hit where I aimed. And here I noticed that those open sights become easier to aim with in certain light conditions. I did hit head-size rocks at about a hundred paces. But after each shot I needed to drop a 3/16” steel rod down the bore. That rod was 13” long, dislodged each case without trouble, and you’re darn right I made sure it was back on the shooting table before I chambered another round. So I’ll try again, next time blackening the sights with the soot from a candle. I’ll load some R-P brass up again, and sort through whatever surplus fodder I have left. I believe the stuff I’ve tried so far is from Turkey. Maybe I have some from another nation. Those 125 grain projectiles I am sure about. I will try them again, with some other load. Either way, the almost a hundred year old beast deserves another go at it.